The Mercedes Benz E Class Estate is where practicality meets luxury German engineering and add in the rear-facing child seats option for £890 and you turn it into an excellent seven seater car. A good choice of engines, three trim levels and a large choice of optional extras mean that you can configure the perfect E Class to suit. 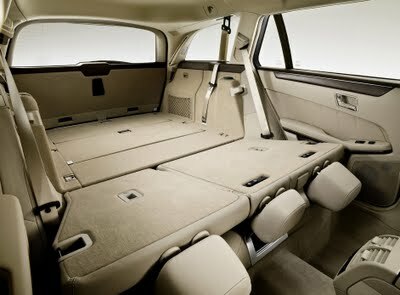 695 litres of space with the boots seats folded. The Mercedes Easy-Pack Quickfold System means you can use just one finger to fold down the middle row seats and have a huge 1,950 litres of load space. The middle row seats unfortunately don’t quite fold down completely flat lying at a slight angle but still give you a very large and practical load space. The middle seat in the middle row is small and you may struggle to fit three child seats next to each other. Mercedes state in their brochure that the seats in the boot are only suitable for small children up to 140 cm in height and the fact that they face backwards may not be to everyone’s taste. But for the odd occasion when you need to carry seven passengers they make this car much more versatile. The boot has an electronic opening so you don’t need to struggle to open it whilst holding the shopping or the baby. The luggage cover automatically slides out of the way when the boot is opened making it easy to put larger objects in. There is an extensive choice of petrol and diesel engines and whilst both are relatively fuel efficient the diesel options are excellent from a perspective of both performance and fuel efficiency. The base diesel model the E 220 CDI is perfectly adequate for this car developing 168 bhp and transporting it to 60 miles per hour in just 8.8 seconds for the manual gearbox. Though most buyers tend to go for one of the automatic gearboxes which on this engine does 0-60 in 8.6 seconds. Top speed is 134 mph. The really excellent thing about this is that with the BlueEfficiency technology this model is still able to return 54 mpg. There is also an E250 CDI and the E350 CDI if you want more speed. And then there is the E63 AMG which gets to 60mph in 4.3 seconds and has an electronically limited top speed of 155mph. There is no struggling with levers or wheels to get your seat into the most comfortable position as all models come with electric seat adjustment. There are a couple of things that might take some getting used to: the handbrake is foot operated as is common in the USA. Also the indicator and wiper controls are both on one stalk. The seats provide good support and comfort for both front and rear passengers although the middle seat sticks forward and is not very comfortable for adults or children. The cabin is perfectly insulated from the outside world with hardly any wind noise intruding. All E Class estates have self-levelling rear suspension so that it doesn’t matter if you are carrying heavy loads the drive will be just as good as if the car is empty. However depending on which model you opt for the suspension set up is different with the SE suspension being the softest as opposed to the sport model which has a much stiffer set up. The E Class achieved 5 stars on the Euro NCAP safety tests and the car includes all the safety features you would expect with the usual array of airbags and stability control. It also has a couple of active safety features that are unique to Mercedes. The Pre-Safe system detects when a crash is about to happen and gets the restraint and protection systems ready to deal with the impact. It even automatically closes the windows and sunroof. Active Bonnet pops up the bonnet so that there is more distance between the pedestrian and the hard parts of the car when the car detects that it is impacting a pedestrian. Mercedes had an impressive reputation for reliability building cars that would last for years but then they went through a rough patch when the reputation suffered and reliability was average at best. Thankfully quality and attention to detail has returned and the E Class estate came eighth out of one hundred cars in the 2010 JD Power survey. This is an executive car so it is expensive to buy and will be expensive to run in terms of servicing and insurance. However the diesel engines are remarkably fuel efficient and low on carbon emissions. For instance the E 220 CDI returns 54 mpg and has a CO2 g/km rating of 136 which puts it in road tax band E costing £120 per year. 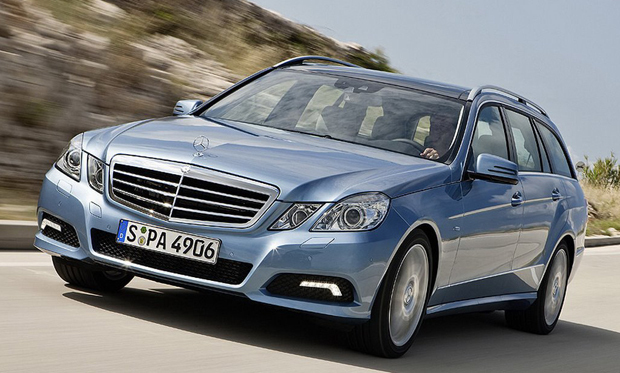 The Mercedes E Class estate is a seven seater car that combines, luxury, practicality and smooth economic engines. If you want a large load space, the flexibility of seven seats but don’t want an MPV this could be the option you are looking for.